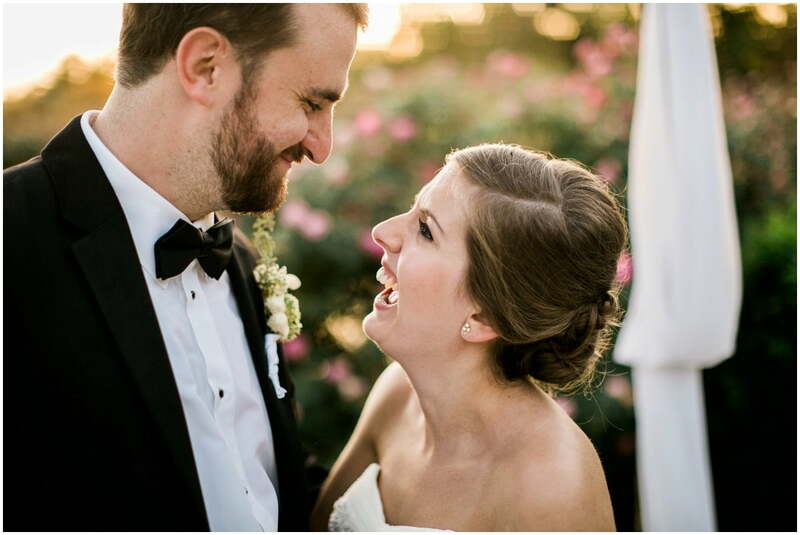 Amelia and Trevor said their vows on a beautiful September day at Merry Hill Farms. Their Merry Hill wedding was full of joy and laughter and gorgeous details. I love this venue so much, it’s one of my favorites in the RDU area. With tons of gorgeous secret nooks, forest trails, miniature donkeys, and peacocks there is no end to the sweet surprises! My favorite thing about this wedding day was how Amelia and Trevor infused fun into every part of it. From Amelia and her bridesmaids playing Heads Up to pass the time once they were all dressed, to Trevor and his groomsmen goofing off during their portraits, to the surprise guest they lined up to visit at the reception (scroll down to see who it was!) they made sure that their day was focused on fun and relaxation. I especially love how they chose to have a private sweetheart table set up on the balcony of the house so they could enjoy dinner together before entering the reception. It is so important to make sure to schedule some time alone together on your wedding day! These two had their focus in all the right places and their joy shows in their photos. Congrats, Amelia and Trevor! May you marriage always be as joyful as your wedding day.